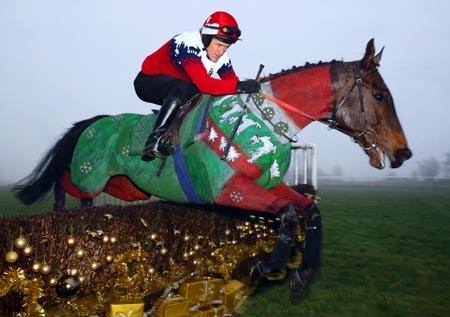 Sporting traditional Christmas wear, AP rode Dr Livingstone, a racehorse who had been painted from neck to hoof in his own spectacular water-based paint Christmas jumper, for the photoshoot. Jockey and mount then jumped a training fence on the gallops that had been decorated specially with tinsel, baubles and presents. AP said: “Everyone is in good spirits over Christmas; it’s a great time of the year to go racing.”The first door on the Jockey Club’s Gift of Racing calendar will open on Saturday (1 December) and over the 24 days leading to Christmas will offer goodies and giveaways, including thousands of free tickets to racecourses, fun videos, festive recipes and festive games.